You already know that Pacquiao-Mayweather fight deal is done for 02 May 2015 right ? but what about the build up, press conference, city tour schedules and undercard details ? well lets get your through the events taking place in next 2 months leading to the biggest fight of this century taking place in MGM Grand between two of the most celebrated boxers of our generation. [ UPDATE ] – It is confirmed Manny Pacquiao and Mayweather will host just one press conference which will take place on Wednesday, 11 March 2015 in Los Angeles. That will be the last time both boxer will come head to head before fight week. The location is yet to be decided but it will be in Los Angeles and wont be open to public. We have already covered and article about limited tickets availability to public for Pacquiao vs Mayweather, very high priced tickets and MGM grand hotel is already sold out. 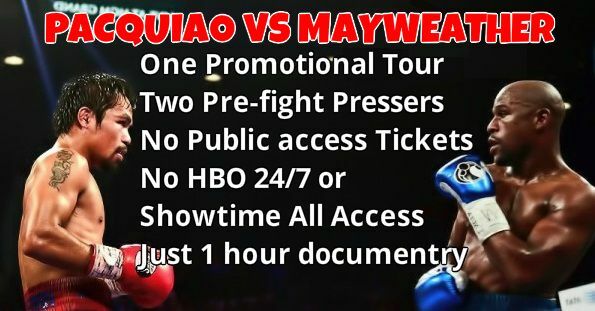 even if you want to see the fight on big screen in some decent hotel or casino in Las Vegas on the fight night you might have to fork out around $200 to $300 while if you prefer to watch it from the comfort of your home by purchasing PPV you will have to spend around $89 to $100 through Showtime & HBO combined coverage if you are in USA and around $35 if you are in United Kingdom. Viewers in Pacquiao’s home country Philippines will watch the fight free on national tv and mexican viewers can watch the fight live on either TV Azteca or Televisa (TBA). But what about the build up to the fight, the city tours and the much anticipated press conference and showtimes’s all access episode date and time line ? here are some of the details you might want to know. ESPN’s Don Rafael suggest their might just 1 promotional city tour either New York or Los Angeles and likely to be only two pre-fight press conferences. Tickets might not be made available to public and there wont be any HBO 24/7 or Showtimes All Access instead there will be 1 hour documentary which both channels will show over and over again to make sure it reaches as many fans as possible around the world. Promotional City Tours Just 1 Promotional Tour and Press Conference on Wednesday, 11 March 2015 in Los Angeles. Pre-Fight Press Conferences First press conference on 11 march, while the next and last one will be two days before the fight. HBO’s 24/7 Rumors has it that there wont be 24/7 or Faceoff shows before the fight.